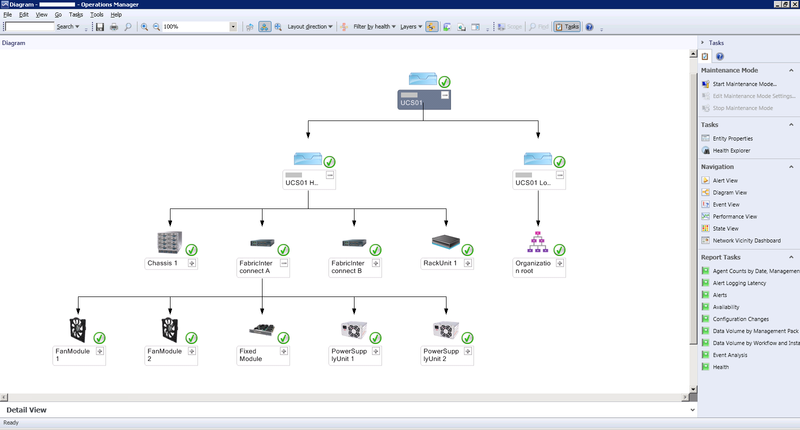 The UCS Manager PowerTool helps automate all aspects of UCS Manager including server, network, storage, and hypervisor management. These cmdlets can be used to execute read, create, modify, and delete operations on all the UCS Manager Managed Objects (MOs). Because everything is controlled by UCS Manager (or UCS Central), the PowerShell cmdlets are executed against UCS Manager by first connecting to a UCS Domain. The PowerShell module also includes a cmdlet ‘ConvertTo-UcsCmdlet ‘ that converts your tasks to a PowerShell format. To explain; As you might know, when you use an Exchange Management Console or an SCVMM Console you can save the PowerShell commands of that task to a file for later use. 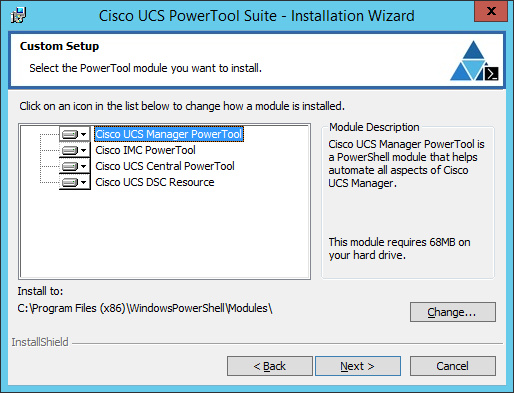 UCS Manager PowerTool offers you to do the same thing, with the difference it is some sort a simulator and does not run the actual task. When you run the cmdlet it will autolaunch the UCS Manager GUI in a browser and you can do your task. When you are finished with your task, you can exit and you are presented with an output in PowerShell format. Personally I don’t use these cmdlets that often. But if you have a large environment and have to do a lot of automation, you will certainly use it. With this add-in you can also open a KVM console to each UCS Server. If you have an issue with an Hyper-V Server and their is an engineer at your datacenter, you can enable/disabled the server LED indicator on a UCS Server. This might not seem that exciting, but since it is integrated in the SCVMM console a physical server is easier to identify. In fact it is quite handy. You can offer SCVMM Administrators a quick health view of the physical UCS servers, without having them to login on UCS Manager. 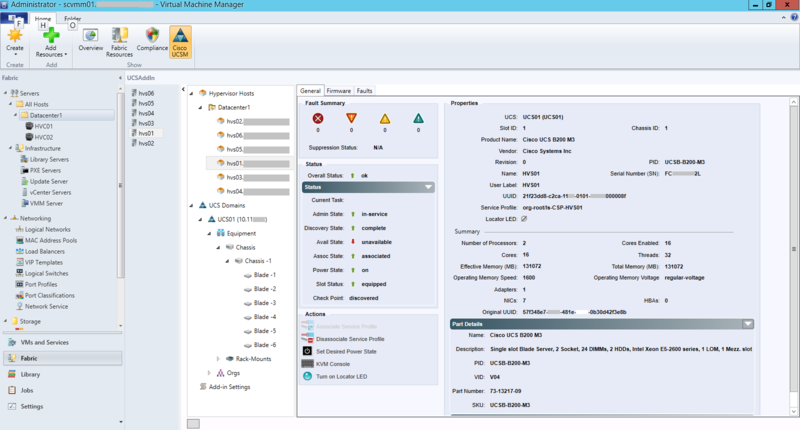 The Cisco UCS Manager Management Pack for SCOM (System Center Operations Manager) provides an extended user interface to the SCOM console that allows you to monitor the health of the entire UCS system. As you can see, Cisco offers enough management solutions that are developed within the partner ecosystem. And they continue to develop new and update their existing solutions. Cisco UCS is a flexible system that I can highly recommend. As you might have noticed in part 1, 2 and 3 I am quite enthousiastic about Cisco UCS. Personally I like the way the entire infrastructure is interconnected. How easy it is to create a Server Profile and having the benifit from a CNA; add as many vNICs and vHBAs as you want. Assigning your VLANs and the correct properties to these vNICs is a breeze. P.S: I have published this part just recently. I going to review it and might add some more information later. Please we aware that Cisco has many validated designs that describe the entire deployment in detail. We have now come to the end of this blog series. If hope the information was informative for you. If it was, feel free to leave a comment. Entire series on the FlexPod is really informative. Thanks for putting this together and sharing it out.